The BBKA’s Module 3 syllabus says ‘The Candidate shall be able to give: …an outline account of the life cycle of Braula coeca, its effect on the colony and a description of the differences between adult Braula and Varroa”. This funny little creature, Braula coeca (Pronounced Browler Seeker), is commonly – but mistakenly – known as the ‘bee louse’. In fact it is a type of fly, although one which can’t, being wingless. 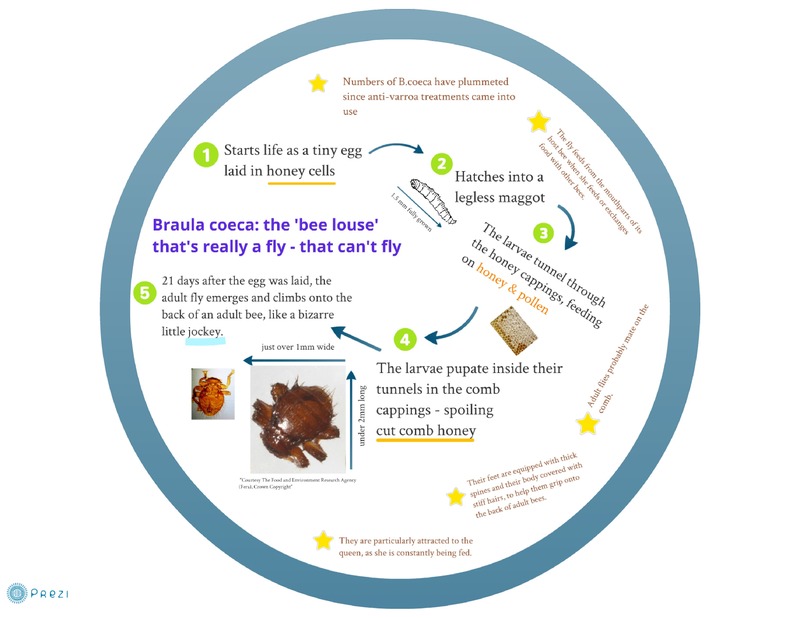 Below is an infographic on Braula coeca which I had a go at making using Prezi. Even though it’s not particularly complex, this took me ages! Respect to infographics creators. If you have trouble reading the infographic, click on this Printer-friendly pdf version to see a larger version. Braula is similar in size and colouring to a varroa mite. 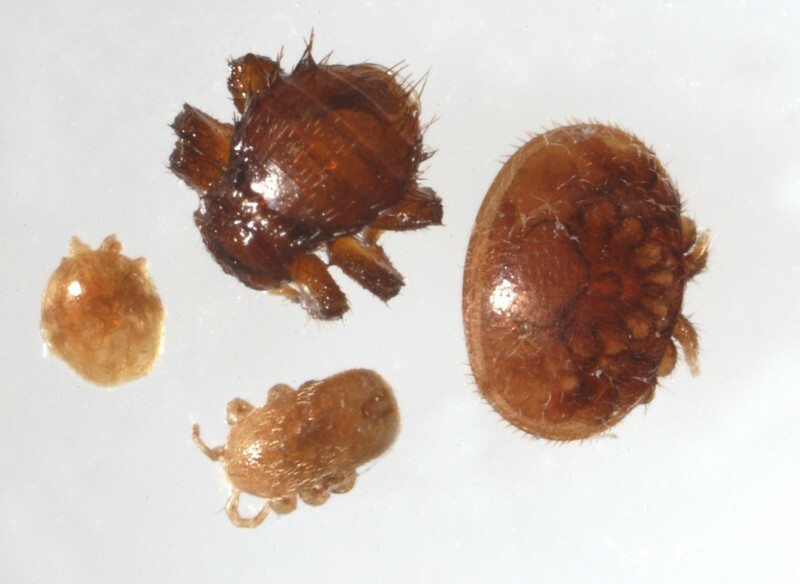 However, an adult Braula coeca has much more prominent legs than varroa (six legs compared to varroa’s eight) and more of a classic beetle shape with its head at its narrowest point, whereas a varroa mite is crab shaped, its legs protuding out slightly at its widest point. Since beekeepers started treating against varroa with miticides, Braula coeca numbers have plummeted, but they used to be regularly observed riding the back of adult bees like little jockeys. When hungry, Braula will walk over the head of its host, lean forward and steal pollen and nectar from the bee’s mouth parts. It does this as the bee is feeding or exchanging food with another bee, or it can also deviously stroke the bee’s labrum (its “upper lip”), causing the bee to regurgitate a drop of fluid from its honey stomach, which the fly then eats. Braula are particularly fond of queens, with dozens often found congregating on a queen’s back compared to typically only one or two Braula on an individual worker or drone bee. More than 180 adults have been found on a single queen (Source: University of Florida entomology department). This is likely to be because queens are fed regularly and consume greater quantities of food than worker bees. To reproduce, the female lays her eggs – 0.8mm in length – throughout the hive, though only those laid in the cappings of honey comb actually hatch, two to seven days later. The maggot-like larvae then burrow just under the surface of the capping, feeding on honey and pollen, creating little tunnels about 1mm wide. After a short series of moults, they emerge from the cappings as adult flies, ready to climb onto an unwitting bee. Like varroa mites, they overwinter by clinging to the back of an adult bee. As they only steal a small amount of their food, rather than feeding on their haemolymph or developing larvae, Braula are not particularly harmful to honey bees. However, large numbers of them riding on a queens’ back must be a nuisance, and the developing larvae tunnelling through the wax cappings of honey cells is a pain for beekeepers wanting to produce cut comb. Extracted honey with the cappings removed will be fine, but biting into cut comb will reveal the characteristic white tracks of the tiny Braula larvae within the cappings. If you live in an area where Braula still survive, the way to avoid this is freezing honey comb overnight as soon as you remove it from the hive, which destroys the eggs and larvae. The Module 3 exam is on Saturday, and I’m really not feeling confident about it. Between starting a new job and trying to find a wedding venue, I haven’t had as much time to revise as usual. I’d love to pass, but if I don’t I’ll go back to revising and retake in November. This entry was posted in Disease prevention, Exams and tagged Module 3. Bookmark the permalink. Oh, I hope we don’t have this creature in Australia – I’ve never heard of it anyway. It’s good it’s not a huge problem but bees have so many little irritants that all add up to be a problem if things don’t go their way. No, you don’t yet – at least, only in Tasmania. There’s a map of its global distribution at http://entnemdept.ufl.edu/creatures/misc/bees/bee_louse.htm. Another parasite the Australians have kept away from the mainland – excellent border controls! Poor bees, now its flies that ride on their backs! I will be sending you waves of support through the internet on Saturday. I’m sure all the good vibes from your readers will help you sail through. From the quality of your blogs on pests and diseases I have every confidence that you will be fine. I am also taking a module exam so I know how you feel. All the best. That’s very kind, thanks. Good luck with your exam too! Thanks again for yet another informative piece. Good Luck with the exam. Wow, I have never even heard of this little critter, and I’ve never seen it in any of the beekeeping books I’ve read. I learn something new everyday. Good luck on the exam! I’d never heard of it before I started revising for this exam. Amazing how many creatures rely on honey bees for their survival. Braula used to be quite common but Bayvarol saw them off and I haven’t seen one in the UK since the 90s. The last one I saw was in Eire in 2000 and it was so long since I had seen one that I had forgotten about them and thought for a moment that I had made the first discovery of Varroa in Eire. Emily: you must come to the annual FIBKA Summer School held at Gormanston College near Balbriggan, about 20 miles N of Dublin. About 300 beekeepers spend a week together + another 100 daily drop ins. There are simultaneous top quality lectures for beginners, intermediates and seniors in excellent surroundings. Visit Dave Cushman’s website for more information or mail me. Thanks Chris. At least that’s one less pest to worry about for us, though I’d much rather go without the varroa. Will have a think about the annual summer school thanks, though I have to bear in mind my holiday allowance and the cost when I’m supposed to be saving up for our wedding! Living in London on a librarian’s salary doesn’t leave much spare cash. I wish you much luck on your exam, Emily. This little critter sounds just like a real bee pest. Can they not shake them off ever, 180 is a lot? Thanks, I’ll need the luck! 180 is the record ever found on a queen, I suspect that would be an absolute infestation. Under 5 would probably be a more usual number. The Braula are designed to be able to hold on tight, with hooked hairy legs, so they would be hard to shake off. So, all you keep giving me are reasons why I should not go into bee-keeping. But, I appreciate the education. Ha ha, you can’t say you weren’t warned! But this particular critter probably wouldn’t affect you anyway, as the varroa treatments used in the US will have killed it off. Your posts are excellent Emily and I have no doubt you will do well in the exam on Saturday. I, however, might not do so well! Thanks Tim, best of luck to you too! Nice to have someone else taking the exams commenting. So glad you enjoyed talking to the beginners Emily. I have been talking to gardening groups for 50 years and still get a buzz! As an old stager might be bold enough to give you some advice. Continue to enjoy yourself, be amusing, say what you think and be yourself! And yes, you will always have a few nerves before you start each talk! Thanks for the advice Roger, much appreciated. Glad it’s not just me that gets a little nervous! Are you going to post about the exam? You can’t leave us all hanging. I hope it wasn’t a stressful day and that all went well. Thanks for thinking of us exam takers… I usually wait till I find out if I’ve passed or not to post about how it all went. Emma and I felt quite positive about it afterwards, so fingers crossed hopefully we’ve both passed. Not too many questions about regulations on importing bees in, which was the part I’d revised least. One question on Braula coeca, so my time spent revising the little critter wasn’t wasted! Sounds great. Don’t you love it when you actually study for the right stuff 🙂 Can’t wait to hear the official results. All the best with your exam – if these posts are anything to go by, you will pass with flying colours! Thanks Rachel – think it went ok, but won’t know for sure till late May! Emily, may I use your infographic in a presentation I have to give on braula coeca next week? You did a great job on it! Hello! Yes of course, I would be honoured!